Update: In this report, the BBC broadcast the names of a number of individuals who, we had been informed, had a leadership role in the Ulster People's Forum. Pastor Mark Gordon has since contacted us to clarify that while he chaired Thursday's meeting of the Forum, he was not elected to the committee nor has he any leadership role or position within the Ulster People's Forum. 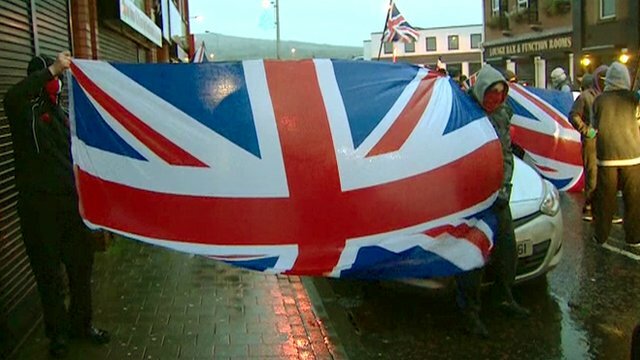 Street protests have been taking place across Northern Ireland, almost on a daily basis, since a decision was taken to fly the union flag from Belfast City Hall only on certain days. The organisation of the protests has been done anonymously with no publicly-declared leadership. Now, many of the individuals who have been speaking at the demonstrations have assumed a leadership role through a new group calling itself the Ulster People's Forum. Julian O'Neill reports for BBC Newsline.